Please make sure you write down the Wood name as you will be asked for this information when you fill out the Quote Form. This is a California Elm wood. This was a free donation from a fellow Pagan. More information to come later! This is a Cherry wood. This was a free donation from a fellow Pagan. More information to come later! CURRENTLY NOT AVAILABLE! 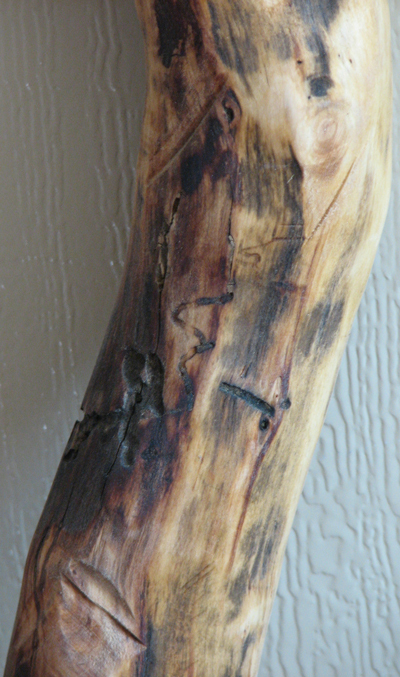 This is a Cork Screw Willow wood. This wood comes from Lirica's Mother's property. More information to come later! This is a Cottonwood. This wood comes from Lirica's Mother's property. More information to come later! This is a Grapevine wood. This wood comes from Lirica's Mother's property. More information to come later! CURRENTLY NOT AVAILABLE! This is a Mermosa wood. This was a free donation from a fellow Pagan. More information to come later! This is a Sycamore wood. This wood comes from Lirica's Mother's property. More information to come later! This is a White Mulberry wood. This wood comes from Lirica's Mother's property. This tree will protect your garden from Lighting. This is a fact. The tree at Lirica's Mother's house was struck by lighting and a limb was split into two pieces. One piece had to be cut off due to the fact that it hung in the path of the yard and no one could walk in the yard. The piece that was cut off is currently being used to make the handles of some of the brooms/besoms. Which makes these handles NATURALLY CHARGED by NATURE!! More information to come later!